Pair this fabulous tote with our matching towel search item WB-M1000BOHO and you are set for your Caribbean vacation or day at the pool! Stunning sea green and blue tones are set on a white backdrop in an on-trend Boho design that is all the rage. The carry rope handles and front trim are highlighted in solid turquoise. Choose to carry the tote by hand or slip it over your shoulder for a super casual look. 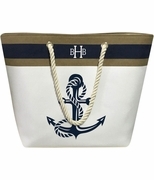 The tote is large enough to hold a towel, sunglasses, sunscreen and novel for some relaxing me-time. The pocket on the outside allows for extra storage and easy access to items like a mobile phone and wallet that you want to have close at hand. 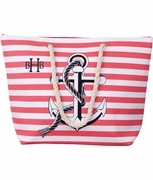 Add the matching cooler tote search item WB-M650BOHO or accessory pouch search item WB-M725BOHO. Very pretty and roomy bag!! Super fast delivery. Would certainly order again.